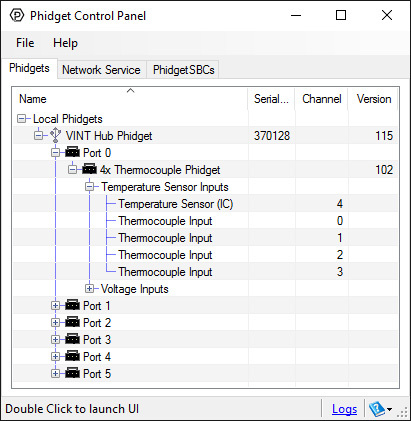 With this Phidget, you can connect up to four thermocouples to a single VINT port, making it ideal for temperature testing and comparison (See the Connection & Compatibility tab for a list of VINT Hubs). 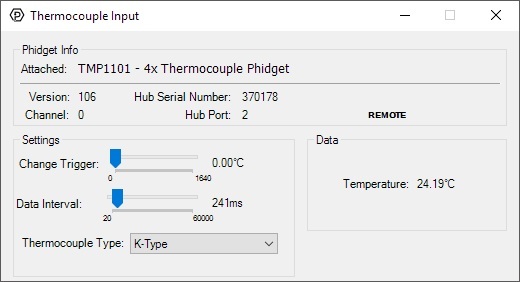 You can use a J, K, E or T type thermocouple; set the appropriate type in software and it will convert sensor data into degrees Celsius automatically. If you have other thermocouple types, you can open the channel in VoltageInput mode and convert to temperature manually according to your thermocouple's datasheet. One of the major advantages of using a thermocouple is the capability of using long wires. Thermocouples have been known to work with segments as long as 100m, while USB and other sensors suffer from voltage drops after 5 or 10m. You can find thermocouple extension wire on the Connection & Compatibility tab. Please note that the longer you make your thermocouple wires, the more likely it is that you'll experience noise and interference. For more information, see our document on Addressing Electromagnetic Interference. Here are some handy accessories for working with thermocouples. Extension wire, adapters, and plugs can be found here. 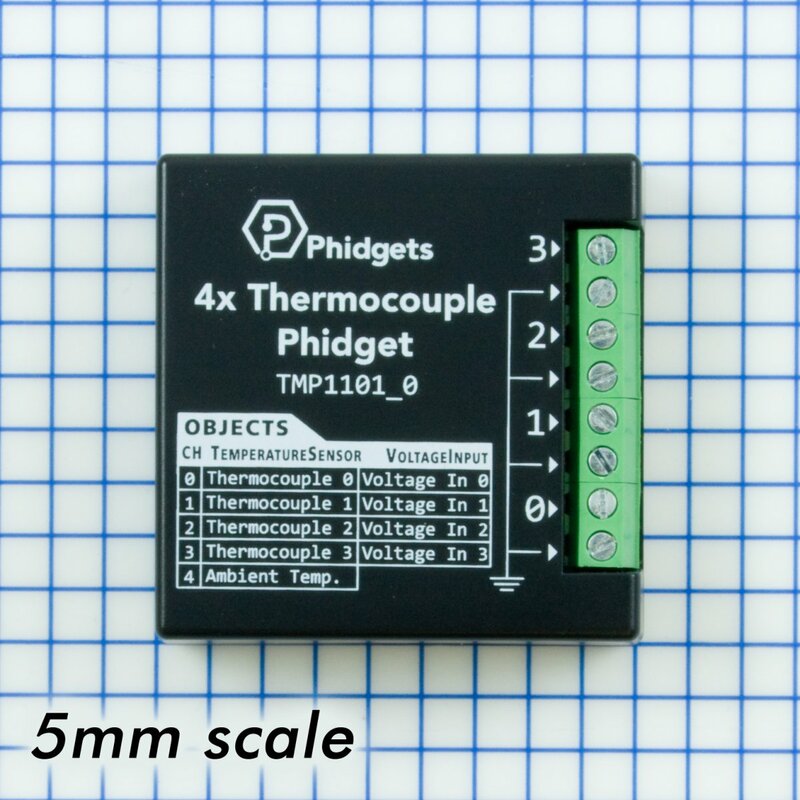 You can connect up to four J,K,E or T type thermocouples to this Phidget. See the product page or data sheet for the thermocouple to determine which end plugs into the positive terminal on the Phidget. If you're not sure which end is which, it won't harm anything to try both configurations to determine which one is right. If the thermocouple is hooked up backward, you'll get erratic readings and the temperature will decrease when it should be increasing. 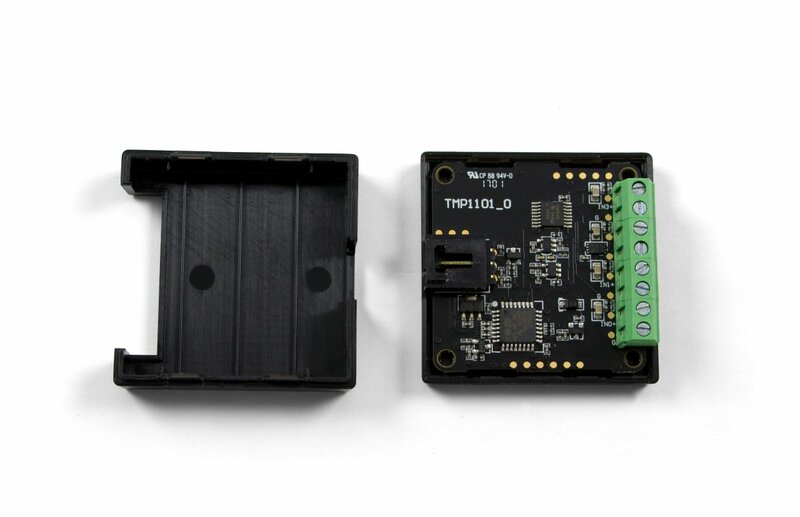 Connect the thermocouple to one of the inputs on the TMP1101. The datasheet or product page for the thermocouple should tell you which wire is positive and which is negative. Connect the TMP1101 to the VINT Hub using the Phidget cable. Now that you have everything together, let's start using the TMP1101! In order to demonstrate the functionality of the TMP1101, the Phidget Control Panel running on a Windows machine will be used. Linux users can follow the getting started with Linux guide and continue reading here for more information about the TMP1101. Select your thermocouple type from the Thermocouple Type drop-down menu. The measured temperature will be updated next to the Temperature label. Touch the thermocouple wire with your hands to see the temperature increase. If the temperature decreases when it should be increasing, you may have the wires plugged in incorrectly. 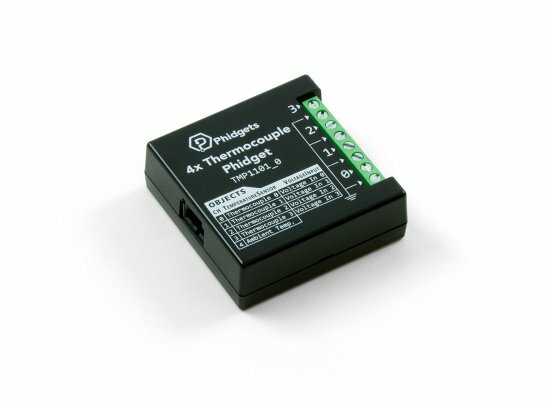 This Phidget is compatible with the TemperatureSensor Examples and the VoltageInput Examples. Thermocouples consist of two junctions, one where the thermocouple meets the Phidget and one where the two wires are welded together at the sensing end of the device. In simplified terms, a thermocouple works by detecting the temperature difference between these two junctions. As such, in order to measure the temperature at the sensing end we need to know the temperature where the thermocouple connects to the Phidget. To do so, there is an ambient temperature sensor on the board. An important thing to note is that the ambient temperature sensor measures the temperature of the board and the air around it, though not specifically at the junction. Generally you can assume they are nearly the same temperature, however as the electronics heat up by being powered on there can be some small error introduced. This is exacerbated by having the board in an enclosed space where normal airflow is restricted thereby increasing the effect of self-heating. As a result we recommend that the board be left in as open and well ventilated/cooled a place as possible to minimize this error source. For more information on thermocouples, check out the Thermocouple Primer. One of the most common sources of electrical noise in a system is 50Hz or 60Hz hum from local power grid. For firmware versions 107 and later for this Phidget, we have added a filter to compensate for 50Hz or 60Hz hum in your system. This means you can worry less about this problem in your application. Without filtering, sensors in electrically noisy environments could see a repeating drift of tens of degrees, as noise from power lines finds its way into the system. The timing of this drift could vary, depending on how the samples from the sensor lined up with the noise from the power lines. To combat this issue, all thermocouple temperature and voltage measurements on this device are now passed through a 100ms moving average filter, with samples taken at specific intervals designed to cancel out frequencies of 50Hz and 60Hz (the most common power grid frequencies). 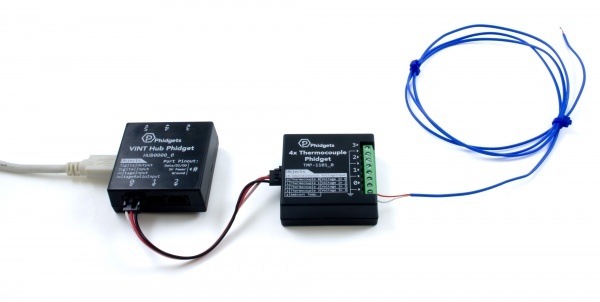 The filtering on this Phidget will reduce the effect of power line noise by 95% or more, becoming more effective as the power line frequency approaches 50Hz or 60Hz exactly. All samples from the sensor will be subject to filtering. When used with data intervals longer than 100ms, the sensor will measure the thermocouple(s) for 100ms to perform a measurement. When using data intervals less than 100ms, your application will see the effects of the latest measurements as they pass through the filter.